Date Added: Saturday 11 August, 2018 by Jan D.
Date Added: Thursday 12 July, 2018 by Brian M.
Very accurate replica of the Professor's diary, right down to the correct elastic band. Take care not to let it fall into the wrong hands! It is a perfect start for creating your own filled in screen-accurate grail-diary, or it is the perfect size for packing along on and using for your own adventures. I am using mine as a journal of my own international travels. Once again Magnoli delivers on a fine product, exactly as I wanted!.. Date Added: Thursday 28 December, 2017 by Duanne W.
Date Added: Sunday 25 September, 2016 by Jeremy S.
Date Added: Tuesday 09 August, 2016 by Alex H.
Date Added: Monday 28 October, 2013 by Holly J.
I've been impresses with Magnoli before, but this journal takes the cake. I am proud to have this in my possession, and I show it off every chance I get! 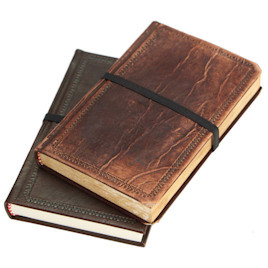 This is a very sturdy and solid journal. Like most of the items from Magnoli Clothiers, It's more than a prop. This can be used on a daily basis and receive harsh treatments like a real world journal. Don't let the screen accuracy of the journal surprise you. It's a great journal that just happens to look like a movie prop. Well Done Magnoli, well done!..